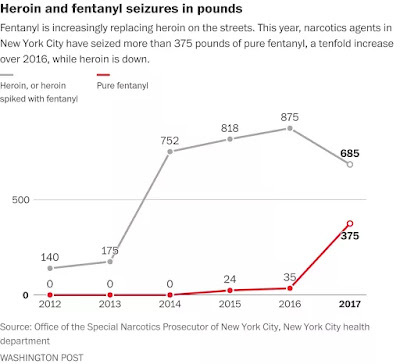 So far this year, narcotics agents have seized more than 350 pounds of pure fentanyl in New York City, 10 times as much as they did in 2016. 141 pounds of pure fentanyl was found in a Queens apartment in August, enough to kill 32 million people, the DEA said. It was the largest seizure of the opioid in U.S. history. The Bronx and northern Manhattan are choice locations for traffickers for the same logistical advantages sought by any commercial distributor. 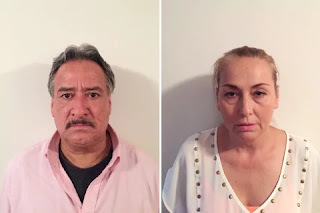 Last month, narcotics agents arrested a Mexican driver in an industrial area of the Bronx with 37 pounds of fentanyl in the back of a delivery truck. 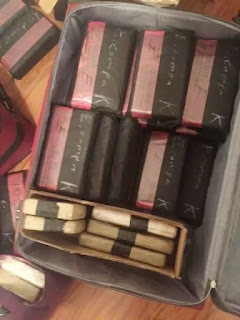 The location was not far from a hotel where, in June, they seized 40 pounds of the drug stashed in a duffel bag. Although the fentanyl boom hasn’t led to more violence in New York, it has produced a staggering death toll. The city had nearly 1,400 fatal overdoses last year, a 46 percent increase from 2015.